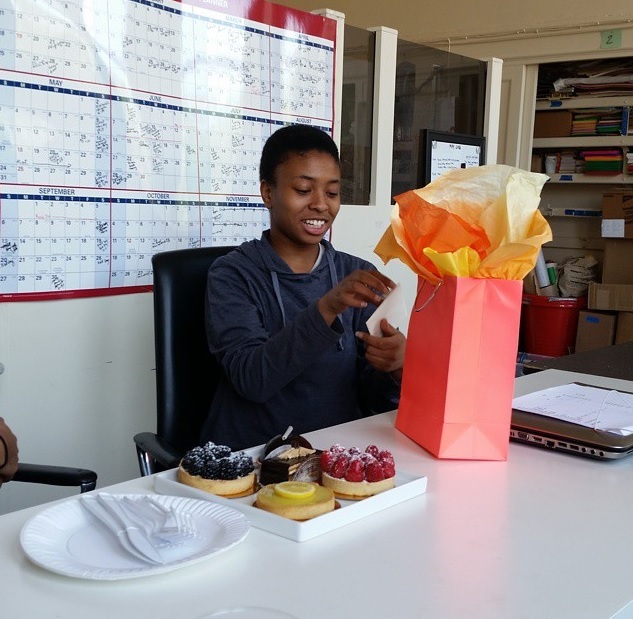 Maat Silin who worked with The LP through the Sadie Nash Leadership Project‘s Community Action Placement program recently completed her internship as a Program Intern. She offered to write a blog post sharing some of her history and involvement with various nonprofits. Click here to read part one of her story and read on for part two. After passing kindergarten at age six, the summer came. For parents who constantly work and have no time for vacationing with their kids during their break, the weeks between June and September can be a nightmare. That’s why summer camps were created! My mom could’ve thrown me in a program at the YMCA (Village People song playing in my head now) but that was money she could’ve used for something on QVC. So, the cheaper (free) alternative was a summer camp program at a school on Decatur Ave. (now the Brooklyn Brownstone School). The closest picture I can find to show how ridiculously huge this school is. In the program, we mainly focused on learning about various countries and their cultures. We also had arts and music classes, and recess. The program ran from Mon-Fri 8am-3pm. If your parents really couldn’t pick you up, they had an afterschool program which ran from 3:30-5pm. If your parents REALLY couldn’t pick you up, then you were screwed. Well, not really screwed, you as the child would be pissed off and begin to wonder about your parent’s parenting skills. The afterschool program really ran until your parents picked you up, but there would be kids who would wait until nighttime to leave. Happy in our make believe”-Tears for Fears, Advice For The Young At Heart. Now to make things less depressing, I stayed in the SCO program from kindergarten to fourth grade and I hated it; I wonder why my mom put me in that program. Back then, I thought I hated the program because of the kids being so defiant. Thinking back now, the kids weren’t defiant, they we just hyper and talkative. The discipline system wasn’t that good, especially, for the afterschool program. To tell a group of kids to be quiet, while you belittle them after you separate them by gender was a recipe for disaster. The leaders of the afterschool could’ve just been considered prison wardens who had an outdated, demeaning way of reprimanding children. Not everyone was being bad. Even in a group of twenty girls, two could be acting out and everyone would suffer. Even with what’s been said and done, now I can’t hate that program as much as I did back then. Everything is a learning process even during bad times. What I came out with from that program, was to respect everyone, race and culture-wise. Like I said, the main focus of that program was to learn about other countries; their cultures and rituals. With that being said they secretly taught us to not be racist, or hateful towards others. For that lesson, I thank them. Why? because I would have never learned about the overview of countries like Cuba, or the religious practices of Islam in any traditional school. If I did, it would be through a biased point of view. As mentioned before, I did the summer program from K-4th grade, and they actually went all the way up to 6th during my last year there. So now you’re wondering, “What happened in fifth grade, Maat?” I will simply answer by saying “I screwed up in school”. I was beginning to be a semi-well performing student in third grade, then procrastination began rolling from then until seventh grade. Around fifth grade I really got lazy, which led to horrible self doubt. Long story short, I got a 2 (graded 1-4) on my standardized test for ELA (english), and Math. Getting a 2 back in 2007 meant you had to attend summer school. But even with a 2 you didn’t have to take the test over again, and you could still proceed to the next grade. 1 meant going to summer school and re-taking the test. If you got a 1 again, you would then have to repeat the grade you were previously in. My mom was livid, but still alright with me being tutored (for a test I’m not required to retake). Turns out my mom was pissed off for other reasons (since she hated standardized testing herself). The time frame of 2005-2007 wasn’t a good time for my charter school. Teachers were leaving left and right and test scores were going down in a dive (more or less). Basically, I wasn’t fully at fault while a mass exiting of students and teachers alike was going on. Also, school procedures made no sense. When a kid went to summer school, it meant that they relearned anything they needed to know before retaking the test they failed. For my situation, it didn’t make sense for me to go to summer school just to not take the test over again. Especially when I didn’t learn anything there! I had more fun in summer school than I ever did at the SCO summer camp. My summer school class at my school was from 10AM-12PM. All we did was play on our class computers. When my mom caught wind of what was going on, she enrolled me into the infamous TASC (The After School Corporation) summer camp at my school. Here comes another non-profit program! Their role has changed over the years but back in ‘07 TASC was of course what their acronym stood for. They hosted afterschool programs in schools like mine that taught their kids “stuff” that to this day, I still don’t know what it all means. The program was hated by 4th and 5th graders alike because they were known to baby their attendees (mainly because they also had to cater to the K-third graders as well). Most of these kids were there against their will (like how I was thrown into SCO by my mom). Survivors (my friends) of the afterschool wars warned me to stay away at all cost. But with a mom who’s job ended at 5PM, I had no choice but to enter the fiery gates of (afterschool) hell. I graduated elementary school at fifth grade, and my adjacent middle school did not have connections with TASC. From what I heard, TASC split up between CAMBA (not-for-profit organization) and Oasis (made parents pay for their program); TASC still exists. From the look at their website now, they’re doing bigger and better things. The After-School Corporation (hence their name) that host various programs in my school. The K-5th grade part of my school, where I attended TASC. Fun fact: The building used to be Pfizer’s old medicine factory. To understand more about some of the dynamics going on in my school, read this 2007 New York Times Article. To be honest, I didn’t mind TASC. Mainly because I don’t remember learning anything there. I found the program being more a safe place, since my mom was angry at my dad, her job, and directing her anger at me (it’s not as bad you might think). Also, my dad had the opportunity to pick me up from the program which was nice for a change. We went on some trips, which nowadays I’m debating on if it was fun or forgettable. The trip I could never forget was going to the Long Island Aquarium. That aquarium alone made the New York Aquarium look like a waste of its approx: $12.00 admission (I may be exaggerating, but the last time I went to the New York Aquarium, half of the fishes were dead). The whole entire atmosphere of the aquarium made you feel like you were underwater searching for the ruins of Atlantis. The outside part of the aquarium was fun, with its numerous mini amusement rides, and its display of South African Penguins. The one thing I will never forget was their boat tour, where we traveled to a stranded island. The island was not that big. One could run across the island at ease. The trip to the “forgotten” piece of land probably got me into my love of collecting seashells and anything nautical. I never knew what that island was, until doing some mini research, I learned that the island is regularly visited by the aquarium (the name is hard to find). The final trip was to Rye Playland. Normally, summer programs would have a big trip towards the end of the program (I forgot to mention SCO’s ending trip was to Dorney Park). If anyone remembers living in NYC in the 2000’s, there were numerous deaths caused by faulty rides, and little supervision, which made Playland considered the “death park” by students in my school. Also, no one wanted to go to Playland because of its childish nature. The trip turned out to be alright, nothing special. Maat Silin is from Brooklyn, NY. She is a rising sophomore at College of Staten Island. Her intended major is Communications: Digital Media and Design. Click here to read our interview with Maat.